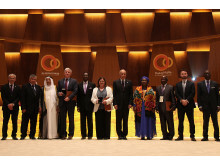 The winners of Kuwait’s Al-Sumait Prize for African Development for 2015 and 2016 in the fields of health and food security have received their awards at a special gala ceremony during the fourth Africa-Arab summit in Equatorial Guinea. The 2018 Laureates were Professor Salim S. Abdool Karim, Director of the Centre for the AIDS Program of Research at the University of KwaZulu-Natal, South Africa who received half a million dollars. The second half of the prize shared equally by Professor Sheila K. West Vice Chair Research Wilmer Eye Institute at Johns Hopkins University School of Medicine, and the Rakai Health Sciences Program. Kuwait has announced the opening of the nomination period of the 2019 US1Million Al-Sumait Prize - for Food Security in Africa . The 2019 cycle of the prize is focussed on Food Security on the African Continent and nominations for Individuals and or Non Government Organizations have been requested by the Prizes Board of Trustees. 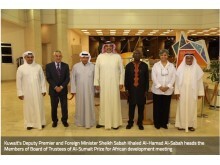 Al Sumait Prize for African Development announced today in Kuwait that the recently closed nominations cycle for the US$1Million health category of the prize has recieved almost double the amount of qualified submisions than the last prize. 108 nominations were recieved from over 35 countries for Organizations and Individuals working to improve health across the continent of Africa. 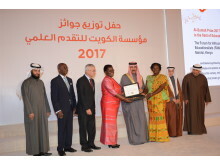 The Forum for African Women Educationalists (FAWE) recipients of Kuwait’s Al-Sumait Prize for African Development for the Education category received their prize at a prestigious awards ceremony on December 13 2017 in Kuwait City. Laureate for the 2017 cycle of Al-Sumait Prize for African Development in the field of Education has been endorsed by the Prize’s Board of Trustees for its exemplary work in Education development in Africa. The recipient organization of the US$1million prize of this prestigious award is The African Women Educationalists (FAWE), Nairobi, Kenya. Al-Sumait Prize was launched in December 2015 based on an initiative by His Highness Sheikh Sabah Al-Ahmad Al-Jaber Al- Sabah, the Amir of the State of Kuwait. The prize honors individuals or institutions who help to advance economic and social development, human resources development and infrastructure in the African continent. 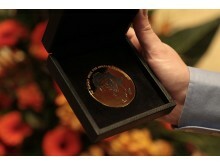 The prize is awarded annually to individuals or institutions within one of three proposed fields – Food Security, Health, and Education – and has a value of $1,000,000 (One million US dollars). 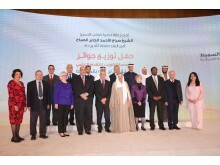 The Kuwait Foundation for the Advancement of Sciences (KFAS) and the Board of Trustees for the prize oversee the prize. Celebrating the life of the late Dr. Abdulrahman Al-Sumait, a Kuwaiti physician who devoted his life towards helping the poor in Africa, the avowed aim of the awards is to contribute significantly to solving major development challenges facing African nations. The A-Sumait Board of Trustees is composed of prominent international personalities in the field of development in Africa and world-renowned philanthropists. The Board is chaired by H.E. 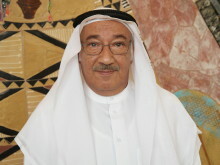 Sheikh Sabah Khaled Al-Hamad Al-Sabah, First Deputy Prime Minister and Minister of Foreign Affairs of the State of Kuwait and Chairperson of the Abdulrahman Al-Sumait Prize. 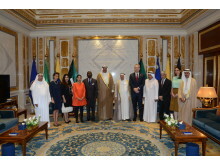 Other board members include Mr. Abdulatif Al-Hamad , Director General and Chairman of Board of the Arab Fund for Economic and Social Development, Mr. Bill Gates, Co-Chair of the Bill & Melinda Gates Foundation, Dr. Donald Kaberuka, Former President of the African Development Bank, Dr. Kwaku Aning, Former Deputy Director General and Head of the Department of Technical Cooperation, International Atomic Energy Agency, Mr. Tareq Al-Mutawa , Executive Member of the Board of Public Gathering Charity Committee and Director General and Chairman of Board of Sadeer Company for Trading and Contracting, and Dr. Adnan Shihab-Eldin, Director General of the Kuwait Foundation for the Advancement of Sciences.